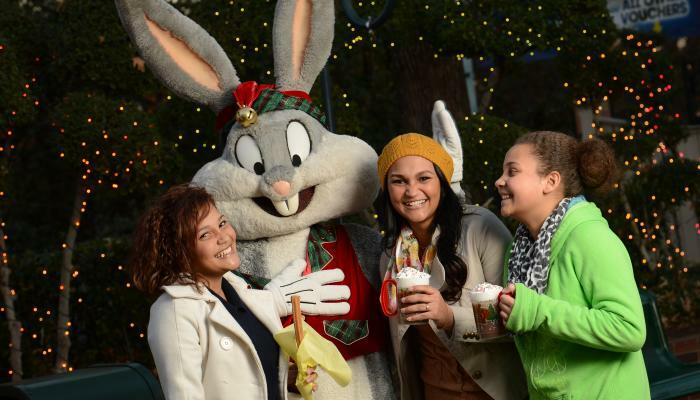 Six Flags Over Texas is a pretty special place on just about any day of the year—but it becomes extra magical during Holiday in the Park, a dazzling experience of lights, music, food and fun that’s long been a “don’t miss” on the list of things to do for the holidays in DFW. This year, Holiday in the Park guests can experience the “sights, sounds and smells of a hometown holiday” in the Merry Marketplace, a new Holiday in the Park attraction located in the park’s Texas section. During your marketplace visit, you can enjoy Campfire Holiday S’mores, hot soup and spuds, warm cinnamon rolls and other holiday fare, all while shopping for gifts at St. Nick’s Knick-Knacks, listening to strolling carolers, trying your luck at reindeer games, or posing for a puckered-up selfie with your sweetie under the Texas-sized mistletoe at the Johnson Creek Schoolhouse. Also, be sure and check out the holiday action at Santa’s Outpost, where younger guests can sit down for Story Time with Mrs. Claus and snap a photo or two with the big man himself. Taking a spin on some of your favorite Six Flags rides in the chill of winter time is definitely a big part of the fun of Holiday in the Park—such as thrill rides like the Titan and the Texas SkyScreamer, or family rides like Yosemite Sam’s Texas Tea Cups or Sylvester & Tweety’s State Ferris Wheel. Be sure and visit the Frosty Snowhill, a Holiday in the Park classic that offers the chance to slide down a hill made of something we don’t often get to experience in Texas—real snow! Much of Holiday in the Park’s festive atmosphere is powered by the abundance of the event’s music, dance and spectacle, so you’ll definitely want to make time during your visit to take in a holiday show or two. Entertainment options include a nightly tree lighting with Santa (through December 23), the Reindeer Holi-Daze Dance Party (through December 23), the “All I Want for Christmas” show (a musical story of an enchanted journey through a magical shop), and the Holiday Tree of Trees Light Spectacular (a dazzling display of animated Christmas tree lights choreographed over holiday musical scores—you’re going to love it!). Holiday in the Park runs through January 7, but only on select afternoons/evenings. Make sure that you check the Holiday in the Park schedule before you head out. There’s no doubt that the park is at its most enchanting when the sun goes down and the lights go up, but still, we suggest that you arrive as early in the day as possible. With so many fun things to do, see, shop and eat, you won’t want to feel rushed or run the risk of missing anything. In fact, you might find it helpful to map out a game plan ahead of your visit that’s based on the things you want to do and see the most, which is why we recommend that you download a complete Holiday in the Park guide here. Five: Layer up and use a locker. If it’s 70 degrees at 2 p.m. but 40 degrees by 10 p.m., it’s probably December in Texas and you’re kicking yourself for wearing the wrong outfit. But even when the weather is unpredictable, Holiday in the Park guests can feel free to don their winter apparel, just in case— if it gets too warm, you can stow your bulky sweater or jacket in a secure Six Flags locker, available for rental near the main entrance gate. Six: Make a magical weekend (or Christmas vacation) with a Holiday in the Park vacation package. If you’re looking for a bright idea for a holiday vacation or staycation, you’re in luck: The clever elves at the Arlington Convention & Visitors Bureau have built a holiday package that includes savings on Arlington hotel rooms and discounts on Holiday in the Park tickets. Find out more.